The Policy Guidelines on Awards and Recognition for the K to 12 Basic Education Program articulates the recognition given to learners who have shown exemplary performance in specific areas of their school life. These guidelines are anchored in the Classroom Assessment for the K to 12 Basic Education Program (DepEd Order No. 8 s. 2015), which supports learners’ holistic development in order for them to become effective lifelong learners with21st-century skills. This policy aims to give all learners equal opportunity to excel in relation to the standard set by the curriculum and focus on their own performance rather than to compete with one another. It recognizes that all students have their unique strengths that need to be identified, strengthened, and publicly acknowledged. In support of the holistic development of Filipino learners, it is important to veer away from valuing only academic achievement based on high grades and move toward valuing and celebrating a wide range of student achievements. The awards aim to acknowledge and promote student excellence in various areas and to provide formal recognition of student achievements that can motivate learners to strive for excellence in academic, leadership, and social responsibility. In effect, the policy encourages all learners to remarkably and skillfully perform specific kinds of tasks critical to their success in school and at work. Consequently, the policy will include all learners and encourage them to be proactive members of their school and community. In addition to acknowledging and promoting the development of the learners’ unique cognitive and other skills that underpin success in school and at work, the awards also aim to nurture the formation of the learners’ values and attitudes anchored on the core values of the Department of Education. 1. In line with the implementation of Republic Act No. 10533, otherwise known as Enhanced Basic Education Act of 2013 (K to 12 Law), the Department of Education (DepEd) is adopting the enclosed Policy Guidelines on Awards and Recognition for the K to 12 Basic Education Program. 2. These awards have been designed to formally recognize the outstanding performance and achievement of learners in academics, leadership, and social responsibility, among other aspects of student progress and development. These awards are given to encourage learners to strive for excellence and to become proactive members of the school and community. 3. All learners, including transferees, who have met the standards, criteria, and guidelines set by this policy shall be recognized. 4. There can be two or more recipients of any award. However, should there be no qualified learner, the awards shall not be given. 5. For learners in the Special Education (SpEd) program who follow the K to 12 Curriculum, the same policy guidelines shall apply. Learners using a modified curriculum may receive recognition in the class based on their performance in meeting the standards of their curriculum. 6. Effective School Year 2016-2017, the Policy Guidelines on Awards and Recognition for the K to 12 Basic Education Program shall be implemented in public elementary and secondary schools, including Grade 6 classes under the old Basic Education Curriculum (BEC). 7. Private schools, higher education institutions (HEIs), technical-vocational institutions (TVIs), state universities and colleges (SUCs), and local universities and colleges (LUCs) offering basic education or any grade levels thereof, shall be responsible for promulgating their policy guidelines on awards and recognition for the K to 12 Basic Education Program, consistent with these policies and guidelines. Any modifications in the guidelines should be subject to the approval of the DepEd Regional Office. 8. These guidelines will remain in force and in effect for the duration of the program, unless sooner repealed, amended, or rescinded. All provisions in existing Orders and Memoranda which are inconsistent with this Order are rescinded. Learners in Kindergarten should be recognized for their most evident and most prominent abilities. They can also be recognized for showing significant improvement in a specific area (e.g., from having poor fine-motor skills to being able to draw or write well). Since kindergarten learners have no numerical grades, teachers are advised to recognize outstanding achievement of learners based on the different domains and/or learning competencies of the kindergarten curriculum at the end of every quarter. Since all learners must be given equal opportunity to excel and demonstrate their strengths, an award may be given to more than one learner. Teachers can choose from the domains and skills listed in Appendix 1. They have the option to provide creative or unique titles for each award appropriate to their context and community (e.g., in mother tongue). Conduct Awards for grades 4 to 12 in each class will be given at the end of the school year. This will be based on the evaluation of the adviser and subject teachers, using the guidelines stipulated in Section VI of DepEd Order No. 8, s. 2015. Awardees must have consistently and dutifully carried out the core values of the Department as indicated in the report card. They must have obtained a rating of at least 75% “Always Observed” (AO) at the end of the school year (with at least 21 out of 28 AO rating in the report card). They also must have not been sanctioned with offenses punishable by suspension or higher sanction within the school year according to the Department’s service manual and child protection policies. for teacherph. This award is given at the end of every quarter to encourage learners to attend and actively participate in class. Perfect attendance means that a learner must be present in all of his/her classes, and must have no absences for the entire quarter. Learners who are representing the school for various purposes (e.g., in-school or off-campus activities) may also qualify for this award. This award is given to learners who have shown outstanding skills in athletics (particularly in games and sports) through participation and victories in competitions, as well as discipline in training and sportsman like conduct and character. The academic rating that will be considered for this award is the student’s final grade in Filipino, English, or other foreign-language subjects and related learning areas in Senior High School specific to the award. The academic rating that will be considered for this award is the student’s final grade in Araling Panlipunan for grades 6 and 10, or the average rating for the core Social Science subjects Personal Development / Pansariling Kaunlaran and Understanding Culture, Society, and Politics) in SHS. Note: Peer evaluation is only applicable to disciplines that involve collaborative work. Candidates will be evaluated by at least 30% of their peers (group, team, class, or club mates) as well as their class or club advisers. Table 7 shows the set of criteria and weights that will be used in the evaluation and deliberation process for this award. Only those clubs or organizationsthat have received at least 90% of the criteria below shall be awarded. Learners who have represented and/or won in competitions at the district, division, regional, national, or international levels will be recognized. These awardees have demonstrated their exemplary performance in academics, athletics, and the arts, and/or represented the school in DepEd-recognized activities. 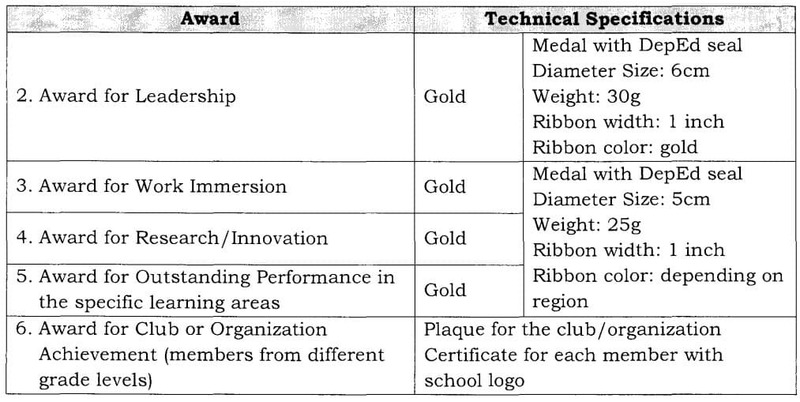 In case external sponsors, partners, and donors opt to give awards, they shall be regulated by the school, subject to compliance with the policy guidelines. These awards should be consistent with the DepEd’s Vision, Mission, and Core Values, and must be named after the trait, value, or achievement recognized, or an esteemed person who is deceased. 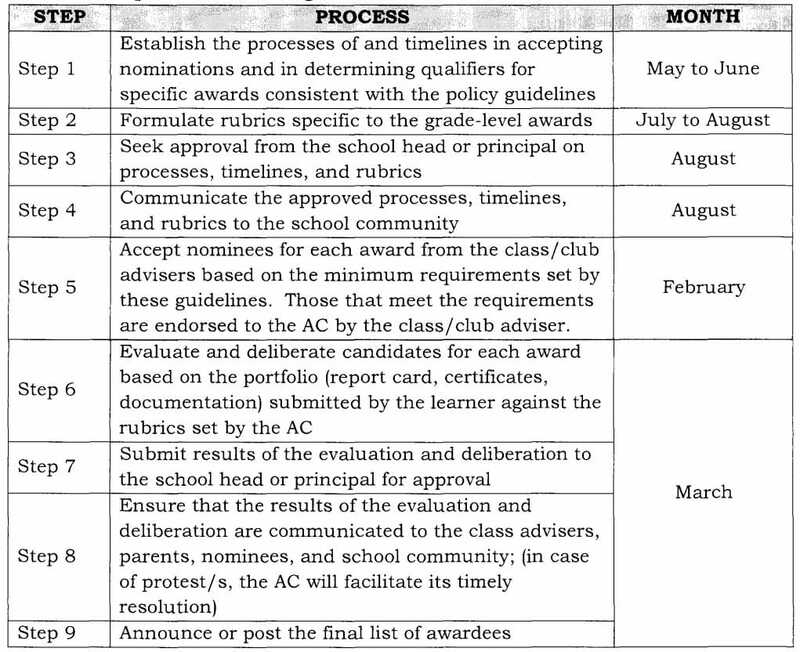 An Awards Committee (AC) shall be organized by the school head or principal in every school for each grade level at the beginning of the school year. For small schools, only one (1) AC shall be organized. The committee must be composed of at least three (3) members from the teaching staff, guidance counselor or designated teacher. The total count of committee members should be an odd number. The chairperson of the AC could be any of the teachers, department head, grade-level chairperson, or curriculum head. No member of the AC must be related within the second degree of consanguinity or affinity to any of the candidates for awards. The report on the results of the AC shall be signed by all members of the committee and certified by the principal. The school head or principal shall approve the final list of awardees upon the recommendation of the committee. If the school head or principal is related within the second degree of consanguinity or affinity to any of the candidates for awards, the school head or principal must inhibit him/herself from participating in the process. The approval shall come from the person next in rank. The documents shall be kept in the office of the principal for ready reference. Copies of the results shall be submitted to the Schools District and Division Offices. The AC, through the Office of the School Head/Principal, shall release the final list of awardees upon the request of stakeholders for scholarship purposes. The AC, together with the school head, shall determine roles and assign tasks to the awardees (e.g., delivery of graduation speech, batch history) for the graduation or school-awarding ceremony. Cases of protest shall be filed by the candidate with his/her parent or guardian to the School Head within three (3) working days from the announcement and shall be decided on by the school head or principal, considering the recommendations of the AC within three (3) working days from filing. In Helping Children at Home and School II: Handout for Families and Educators, S4-75-4-78. 2nd ed. National Association of School Psychologists, 2004. 2015. http:// www. edu. gov, on. ca/ eng/ parents/ IntroDocEng. pdf. Chance, Paul. “The Rewards of Learning.” Phi Delta Kappan 74, no. 3 (November 1992): 200-07.
http://andrewvs.bloas.com/usu/files/the rewards of learning, pdf. The other awards were not presented in our school, such as best in communication, mathematics, social science and a lot more. How does it happens? Do they violate the policy? grade level. Ty I need justification to this..